This lesson describes how to complete the Primary Eligibility section when the IEP recommends that the student is not eligible for special education services. 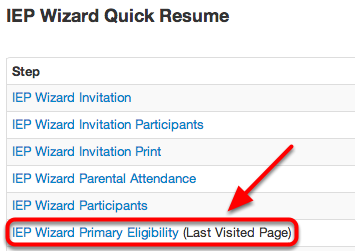 From the IEP Wizard Quick Resume Menu, select IEP Wizard Primary Eligibility. 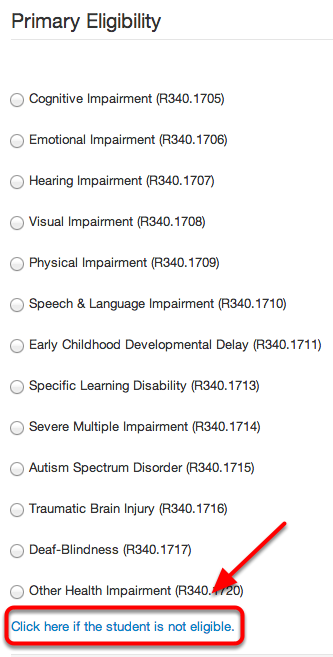 Click on the link to indicate that the student is not eligible for special education services. After clicking the link (see above step), you will be automatically taken to a page requiring an explanation of the team's rationale for this decision. For more information on how to complete the IEP Ineligible Rationale section of the Ineligible IEP see, "Provide Rationale for Ineligibility" lesson in this manual.